There are a lot of shoe storage solutions out there to help you no matter what your special situation may be. I thought I knew all the options available when trying to solve one of my shoe organizing problems, but boy, was I wrong. Of course, some options are more popular than others, but let’s run through the huge list of options I DID find. First, a few tips for organizing shoes to get you started. As with most organizing projects you must start by purging your excess… shoes in this case. Toss anything you just never wear, that doesn’t fit, that always hurts your feet, that are completely worn out, are no longer in style, etc. Let go of these shoes to help make organizing easier, have more space, and to make room for new shoes!! Where do you have problems with shoes getting out of control? Our entry way becomes a shoe traffic jam (or pile up rather) without continued clearing of the shoes, despite the shoe rack we have there. I think it’s time to try something different. Figure out where you want to store you shoes. Are you strictly putting shoes in your bedroom closet? Do you keep shoes in the entry way of your home, in the garage, in a coat closet? Think about where you plan to put them and how many pairs of shoes will go in each area. Take some measurements of the areas you intend to use for shoe storage. Also think about nearby door or closets that may be useful. Jot these down before you go shopping for the perfect shoe rack. Original Shoe Box with a Photo - Keep your original shoe boxes when you buy a pair of shoes. Take a Polaroid or a digital photo and attach it to the end of the box so that you know what pair of shoes is inside. Stack these boxes on a shelf or on the floor of your closet. Clear Shoe Boxes with Lids - If you don’t have all the original shoe boxes, you can invest in some inexpensive clear plastic shoe boxes. You can see through them to see what shoes are inside, or you can still opt to place a picture on the outside of the box for a better view. Shoe Bins - The shoe bins I’ve seen are like shoe boxes without tops, but usually two bins stuck together side-by-side and can hold up to two pair of shoes. You can stack these bins on top of each other and then purchase a top cover for the top of the stack of bins to keep the dust off. The problem with this type of storage is the need to pull down the bins to get to the pair of shoes you want. Shoe Drawers - These are plastic drawers that allow you to pull out the drawer with the shoes in that you want. No un-stacking a pile of shoe boxes to get to the one you want and no fear of all the boxes toppling over on you. This is a good option for shoes worn more often. Drop Front Shoe Box - These are fancy shoe boxes but instead of a top, they have a drop open front panel, usually with a clear window. This allows you to see what’s inside of the box and to remove them without having to pull down the entire stack to get to the box you want. Overdoor Shoe Bag - If you have closet doors that swing open or even a bedroom door that’s available, you can hang a shoe bag over the door. These come in a variety of sizes. Some lie flat against your door with pockets down the front in which to slide the shoes into. There are also some that stick out slightly further in which the shoes slide into cubbies on the sides, similar to a herringbone pattern. Hanging Shoe Bags - These common shoe storage options are like instant shelves or cubbies in which to slide your shoes into and they conveniently hang on your existing closet rod. This also helps to keep your shoes up off the floor and closer to eye level. Stacking Shoe Shelves – These are, well, shelves for shoes and they come in many materials and types. Think wood, pressed board, wire, expandable, you name it. Many of them allow you to stack several units on top of each other helping to use that vertical space. Shoe Cabinet – This is like a filing cabinet for shoes! Who woulda thought! This shoe storage option helps to keep your shoes out of sight, but when you open the fold down door you can see your shoes. Some of these are quite tall and only about six inches deep so they save a lot of floor space and help to store vertically. 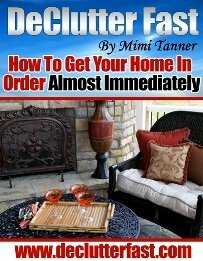 There are also some that are somewhat deeper and shorter that can also purpose as an attractive bench to put in a bedroom or entry way of the home. Shoe Compartment Organizer – These are typically a unit of cubby holes in which to slide your shoes into. They come in various sizes and materials and can hold various numbers of shoes. These are good for using vertical space to store shoes. Some are even available with doors on them so you can hide your shoes away for a cleaner look. Shoe Racks - These can also come in several varieties. They are similar to shelves in that your shoes rest on the shelf made of two horizontal bars that go across the rack. They are often stackable or expandable as well to allow you to expand your shoe storage needs over time. Wall Mounted Shoe Racks - These racks are similar to the ones described above, but they’re mounted to brackets that are attached to your wall. They can then be adjusted up or down to accommodate how many shelves you need and the height of your shoes. You need some clear wall space to use this option. Overdoor Shoe Racks - These are simply shoe racks that are hung from a swing open door. Possibly not the most attractive option but if you’re short on space, this will work. You could even cover the rack with a nice fabric “curtain” to help hide them away and prevent them from getting dusty. Canvas Shoe Stand - This is basically a shoe organizer with cubbies but made of canvas and can be folded up and moved easily. This would be great just about anywhere, especially in a coat closet or garage, or to take to a college dorm! Revolving Shoe Tree - Just as it sounds, a small tower with three or so tiers of shoe holders in which the toe portion of an individual shoe slips over the holder like a leaf on a tree. This would be great for keeping your most worn shoes easily accessible, especially in a small entry way. Shoe Wheel - This is a shoe storage option you simply need to see! Think of a hamster wheel, only it holds up to 30 pair of shoes! It’s light weight, colorful and on casters so it can easily be moved around. Take a look by going to Rakku Designs. Under Bed Shoe Chest – To help store those out of season shoes you might consider a vinyl storage bag that is intended specifically for shoes. It has dividers and helps keep your shoes organized as you slide them under a bed until their season returns. You may want to sort your shoes by type: casual shoes, sport shoes, dress shoes, etc. Out of season shoes can be stored away when they’re not needed. A clear vinyl shoe chest under the bed works great. Evening shoes or shoes that are not worn often can be stored up on a shelf along with a photo of the shoes on the box. This way they don’t take up valuable shoe space needed for your every day shoes. Stuff boots with crumpled paper bags so they maintain their shape. Or you can purchase boot shapers which stretch the boot enough to keep their shape and allow you to hang the boots on a closet rod. 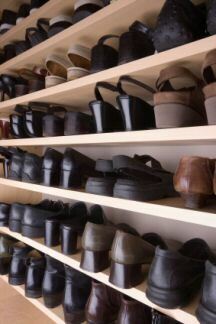 Keep the shoes you wear most often in a shoe storage system that makes them easy to see and access daily. You can store the rest of your shoes in less accessible methods such as clear shoe boxes. Set up shoe racks where you need them and make the most sense for you… the garage, entry way, bedrooms, coat closet, etc. I hope these ideas and products get you started to storing you shoes in a more organized fashion. I have tried to capture as many ways for organizing shoes as I could find, but I will certainly keep my eyes opened for any thing new that comes along!